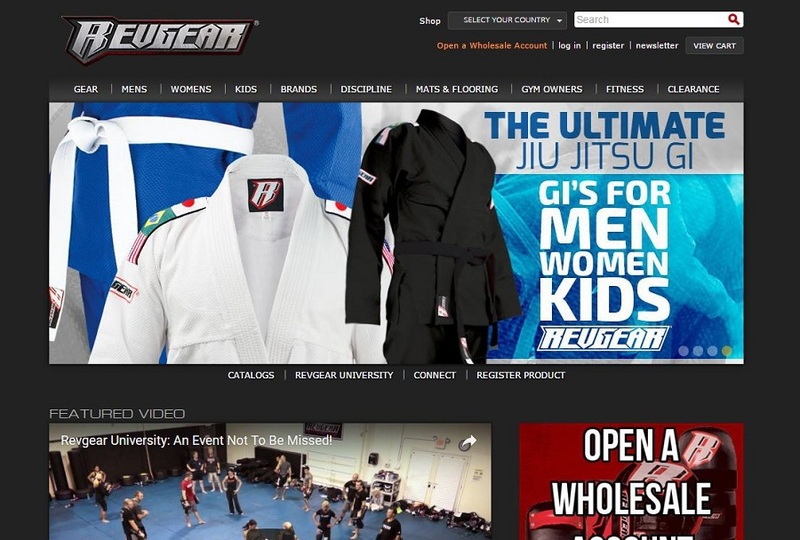 Quick Background : Revgear Inc. designs, manufactures, distributes, and sells martial arts equipment and apparel under their label worldwide. They also manufacture equipment and other products for industry giant, Bad Boy LLC. To sum it up: putting Revgear on the “marketing map”. While they arguably build the world’s finest products in one of the fastest growing sports in the world (Mixed Martial Arts), Revgear was largely unknown to the public: to both athletes in the martial arts and fans of martial arts (their two main target audiences). The ultimate goal was to greatly increase recurring corporate revenue through e-commerce sales and sales leads. We concentrated on increasing Brand awareness, Brand recognition and Brand cohesiveness. All areas of Internet Marketing would be employed to drive the awareness and traffic and revenue to Revgear. Concentrated on using the Revgear logo on the websites, Videos, Press Releases, and across all of their affiliate websites, including blogs and email marketing. Creating a style guide for website/brand cohesiveness. Analysis of Keywords derived from Keyword data tracking services, website, available analytics, competitors and other online sources. Determined effective search engine marketing strategy by analyzing website structure, content, Meta data, select rankings, search engine and referring traffic, page cache trends, effectiveness of Links. Evaluate top ranking competitors. Analyze competitor keywords and effective SEO techniques they are using. Reworking page titles, descriptions, & keyword Meta Tags with the most searched keywords that relate to each specific webpage. Increase keyword rich content, image alt text and anchor text linking. Site-wide footer containing links and keywords. Ongoing and continued SEO on new products, current pages, etc. Optimized static web pages, video addition, and social network integration. Manual submission to all major search engine and human edited directories. Optimized individual products and categories based on page content with targeted Keywords. Optimization suggestions for improved cart functionality for SEO purposes. Rewrote and created new URL names for maximum SEO effectiveness. Prior to SEO there were 7 inbound Links, currently over 1,400 Links according to HubSpot; Built Links with a combination of offpage optimization including Link bait, blogs, social networks, and manual Link requests. Created Blog (branded to business, continuously updated with promotions and current info). Multiple optimized posts. All posts optimized with correct tags, category creation, and Keyword-rich URLs. User engaging elements. Links to main production website. Overall Blog management and maintenance. Assistance with Facebook and consulting on usage for marketing purposes; Twitter page creation, customization, management and optimization to increase web traffic. Helped increase followers; YouTube Channel creation, customization, and continued video uploads and optimization. Consulting with Client over redesign. Provide User Interface examples and feedback. Create Press Releases to Target potential Customers. Release Optimized versions of the Press Releases online. Press Releases shared to hundreds of reputable editorials. The GOiMarketing programs have been hugely successful for Revgear. Sales have more than doubled in the first six months of the program and continue to grow and drive additional revenue. The website is attractive, dynamic and powerful. All aspects of the SEO and Marketing plan work harmoniously to produce steadily increasing sales and traffic. The internet marketing practices and Search Engine Optimization programs have proven very successful to traffic and more importantly, revenue.